Are you interested in discovering more about equine behavior and how horses think, learn and perceive their world? Do you want to know more about care and management based on what's best for the horse? Do you want to improve a horse's well-being? The nonprofit Equine Research Foundation has the information you're looking for. 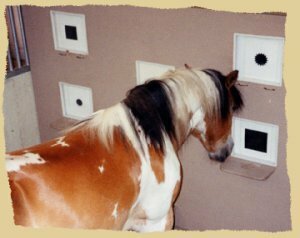 Equine learning, cognition and perception has been the focus of the Equine Research Foundation's scientific studies since 1992. 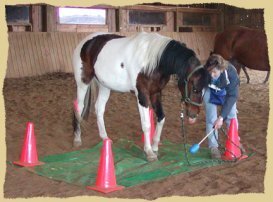 Using methods based on positive reinforcement, the Foundation has conducted many research projects that have helped scientists as well as the general public better understand the nature of the horse, why it behaves as it does, and how to best train and handle horses using a positive approach. Discover how horses think and learn and how they view their environment by learning as much as possible about them through the Foundation's publications, consultations or horse training clinics. Use this knowledge to create trust, establish strong bonds, form willing partnerships, and train using gentle methods horses understand. 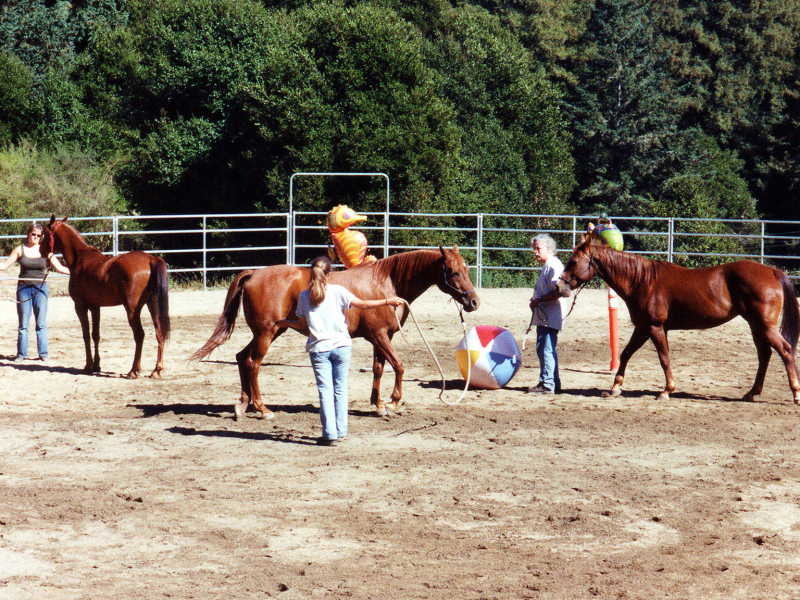 Learn about the Foundation's alternative horse training methods, which are based on equine behavior, eclectic horsemanship, and positive reinforcement. Dreaming of having the perfect horse? 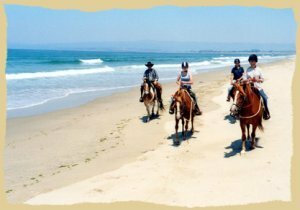 Wanting to develop excellent relationships and strong bonds with horses? Desiring to do more with your horse than you have ever done before? 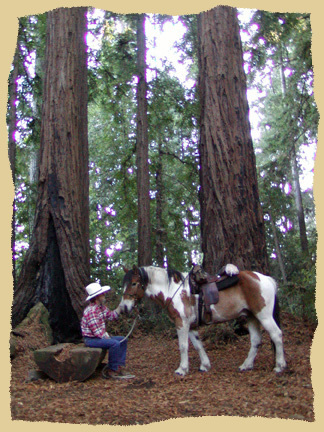 Hoping that your horse will truly want to be with you and follow you at liberty, anytime, anywhere? 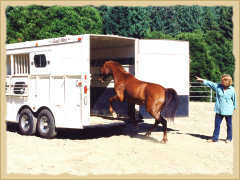 Wishing for a safe, trustworthy horse that responds to your lightest cues? Striving to understand how the horse's mind works and to use this knowledge to excel in horsemanship and training? Thinking of buying a horse but do not know enough about them? Been riding for years but still want to expand your skills and knowledge? Having problems with your horse that need to be worked through, including those involving respect for your space? Simply fascinated by horses and wanting to learn more? Read on for detailed information about the Foundation's positive reinforcement clinics, consultations, purposes and tax deductions. Visit our horsemanship pictures and our horse research pictures pages for photos of activities, public programs and projects at the Equine Research Foundation. These photos provide a sampling of our past and recent daily activities. Also, see what people say about their experiences with the Foundation. 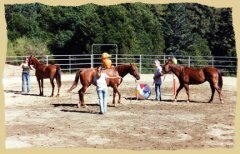 The Equine Research Foundation offers off-site positive reinforcement horse training clinics within the western states. 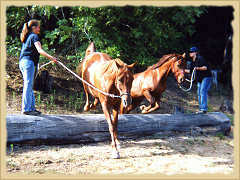 Horses learn through both positive and negative reinforcement. 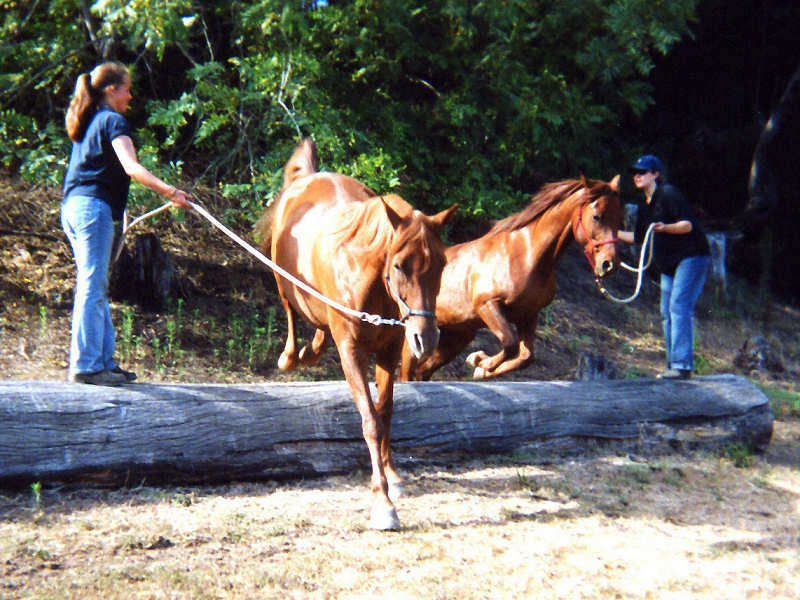 Through negative reinforcement (still today a horse training standard) a horse performs an action in order to avoid something unpleasant, such as moving away from pressure. Through positive reinforcement, a horse learns to perform a behavior in order to receive something he desires, such as food, stroking, or praise. The horse becomes an active participant, eagerly seeking out the right answer. Dull horses brighten, sour horses turn sweet, and the underachiever suddenly moves to the head of the class. Our PR clinics last for three days but can be custom-tailored to meet your needs. Clinics are conducted by Dr. Evelyn B. Hanggi and Jerry Ingersoll, co-founders of the Equine Research Foundation. Minimum number of participants is 12, maximum is 15, which ensures a lot of individual attention. For more information about our off-site clinics, or if you wish to host or promote one of our PR clinics in your area, please call (831) 662-9577 or contact us online. The Equine Research Foundation offers phone consultations that cover topics involving horse behavior, training, handling, cognition and perception. If you have questions about these topics, or are looking for help with your horse, then you might consider having a talk with one of our experts. For more details about this service, please see the Consultation page. The purpose of the nonprofit Equine Research Foundation is to further scientific and public knowledge about the learning abilities of horses, and their behavior, training, care and welfare. The Equine Research Foundation supports noninvasive research aimed at gaining a deeper understanding of the learning, cognitive and perceptual capabilities of horses. The study of cognition is concerned with the mental processes, representations and skills involved in thinking and learning. Researchers at the Equine Research Foundation have found that horses have more advanced cognitive abilities than was previously thought and can solve complex problems. These noninvasive studies, which are based on positive reinforcement, show that horses are thinking creatures that respond best to humans who acknowledge their minds and emotions. Interested individuals can learn about all aspects of the research and gain a deeper understanding of how our findings apply to daily interactions with horses as well as training and handling. Each year thousands of horses are bought with the best intentions. However, each year a like number are sold again because owners find that their ideas of horse ownership are not reality. Horse ownership requires time, money, and most importantly, knowledge. 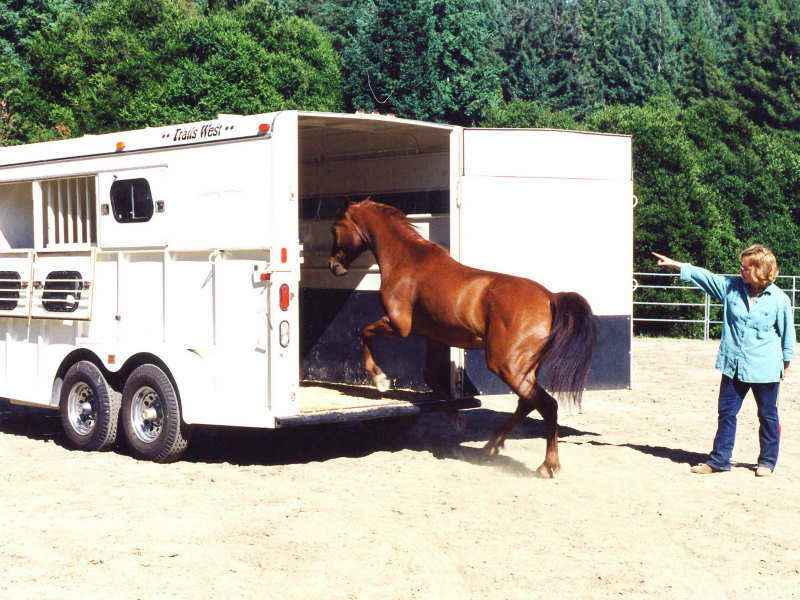 Understanding equine behavior is the key to excellence in horsemanship. Gaining insight into how horses learn and perceive the world and how to use this knowledge to help with horse training and handling is one of the most important aspects of successful horse management. One goal of the Equine Research Foundation is to make its research results available so they can be used to improve human-horse interactions. To understand and then satisfy a domestic animal's needs, one must learn as much as possible about its basic psychological and behavioral processes. In the past, much time has been devoted to understanding the horse's physiology but relatively little attention has been directed toward the horse's mind. By ignoring psychological needs, humans create stress for horses and when stresses are prolonged, health and behavioral problems occur. When behavioral problems arise, the horse is often blamed, then shuffled from one trainer to another only to be returned to the same conditions or sold repeatedly. Finally, the horse is labeled a "problem" and then neglected, abused, or abandoned. Psychological factors such as feeling, thinking and remembering are cognitive processes that affect an animal's overall well-being. Therefore, if we want to provide the best environment, training and handling methods for our horses, we must understand their cognitive and motivational processes. For its operating funds, the Equine Research Foundation relies on grants as well as public donations, which generally qualify for a charity tax deduction. The foundation uses these funds to further research, raise public awareness and provide continuing education by making information available through publications and program participation. You can help the Foundation reach its goals by making a tax-deductible donation. The amount is up to you. The Foundation accepts checks, money orders and online payments. Please see our Donations page for details or click on the Donate button below to contribute right away. Please contact us with if you have any additional questions about becoming a supporter. Visit our Publications page for Equine Research Foundation horse articles and television, Internet and radio programs featuring the Foundation.